On the heels of a holiday season which many treat as gift days, Kari-Lynn Winters' newest picture book, Gift Days, from Fitzhenry & Whiteside exemplifies the true nature of a gift. It is not a present given on a statutory holiday or to commemorate the anniversary of one's birth. It is a heartfelt sharing of something that is and will be cherished, freely and without expectation of reciprocity. 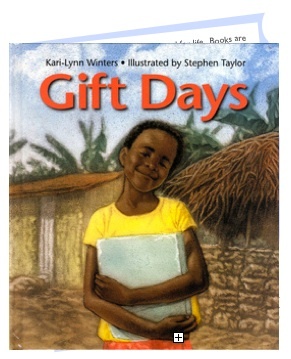 Gift Days takes the reader to Uganda where a young Nassali is expected, since the death of her mother, to prepare the meals, fetch the water and firewood, and look after her younger sisters, the weeding and the washing. The expectation for Matovu, her older brother or baabawe, is to attend school and learn lots. But Nassali dreams of learning to read and write and going to school. "Maama always said an education is the path to a better life." Knowing that "Maama would have wanted it this way", Matovu begins to complete Nassali's chores one morning a week so that they can spend time practising reading and writing. These special days become her Gift Days. By emphasizing Nassali's desire to read and write and become educated, rather than the custom that she take on the household responsibilities upon her mother's death from HIV/AIDS, Kari-Lynn Winters takes Gift Days from the hardship of a young girl's life in Uganda to the story of a young person determined to find the means to succeed, albeit with constraints. Kari-Lynn Winters notes in her afterword that, although Article 28 of the UN Convention on the Rights of the Child declares that every child has the right to a good quality education, many do not have access to it by virtue of geography, economics, health and traditional responsibilities. Gift Days provides the hope that an education is within the realm of possibilities for everyone and anyone, even if that education is not provided in a traditional school setting. Artist Stephen Taylor's rich illustrations evoke both the warmth and starkness of Nassali's life but his final illustration of an adult Nassali, so simple and encouraging, takes the story to a reassuring and bright resolution, just as her future appears to be. This review gives a gift day to KLW, ST, and to F&W too. Well written!